Reduce saccharification time, break down starches in unmalted cereals, and increase attenuation with one simple product! 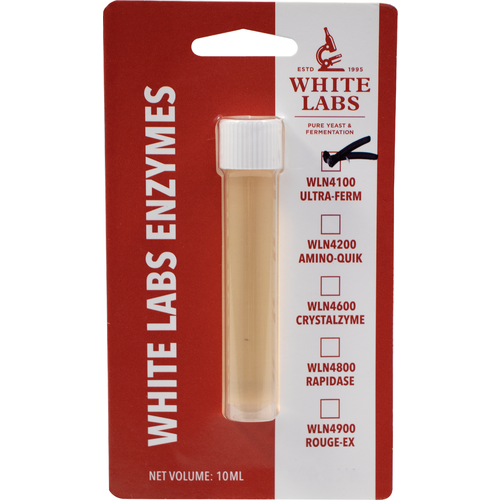 Ultra-Ferm from White Labs is a highly concentrated liquid amyloglucosidase derived from a select strain of Aspergillus niger. Rather than acheiving 75 to 80% hydrolisis of present starches, as you would with traditional brewing methods, Ultra Ferm allows total hydrolisis of dextrins to fermentable glucose, from all types of starch. UltraFerm WLN4100 makes for the perfect additive when brewing a Brut IPA or Champagne Beer by eliminating residual sugar, allowing you to acheive the dry flavor profile that is signature to the style. It can also be used for the production of low calorie and extra high-alcohol beers, as well as light or diatetic beers. Add at the beginning of the mash-in. Ultra-Ferm optimal pH is between 3.5 and 5.5. Temperature should not exceed 140°F. Amyloglucosidase activity is completely destroyed when the wort is held at 185°F for 10 minutes. 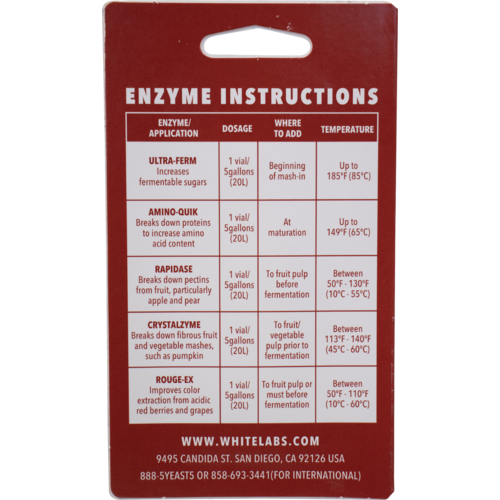 We've experimented with adding this enzyme at different stages throughout the brewing process, and found that it isn't limited to the mash stage alone. When pitching Ultra Ferm alongside our yeast, we were able to achieve a final gravity of 1.000, with no negative effect on the finished beer. Great news for the extract brewers out there that want to produce an extra dry beer! Store at 39-46°F. Stable for 12 months. Recipe specific. Standard amylase not strong enough. I have friends that like my beer and think that they can tell when gluten is present. To make a Brut IPA. To help with brewing a Brut IPA. Is there any downside to adding half the vial? Can I just let it sit in the wort for twice as long before denaturing it? I doubt there's much downside, from my brief experience using the whole vial is massive overkill. I added 1mL [1/10 of a vial] to an FV containing 6 1/2 gallons of Cream Ale that had finished at 1.008, several days later it had dropped to an FG of 1.002. I had similar results the only other time I've used it, this time on an Imperial Stout that petered out in the mid 30's, 1 mL of Amylo in about 5 gallons got it down to the low 20's. I skipped adding any portion to the mash and instead added an entire vial to the 5 gallon carboy fermenter. If I am understanding your questions, you may be attempting to save costs by using 1/2 rather than a whole vial per 5 gallons. If this is your intent, I would recommend attempting to add just half to fermenter rather than mash. In a starting gravity of 1.053 it obtained a finishing specific gravity of 0.996. I typically use half the vial in the mash and the rest goes in the fermentor. Amylase is not a "1-and-done enzyme and will keep eating at below 150° until you kill it in the boil. Just extend your mash...2-3 hours. I used to make Morebeers BRUT IPA. The final gravity came out at 1.000. Beer came out fantastic. Looking forward to experimenting with other styles. Used in an extract Brut IPA. Added to primary, waited for readings to stop dropping and an additional week after that. Beer finished at 1.011, maybe lower by a bit but certainly not worth the extra money for such a small drop. Maybe I just got a bad batch? Does exactly as specified. I added to primary fermentation when gravity was 1.020 and the FG ended up at 0.996 which is right on target for where I was aiming.